Celebration time for Larne in the Irish Cup success over Crumlin Star. Pic by INPHO. Two second-half goals from David McDaid helped Larne come from behind to see off Crumlin Star and book their place in the last eight of the Tennent’s Irish Cup. 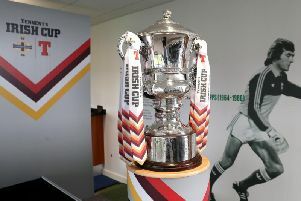 A shock looked to be on the cards early on when former Coleraine and Portadown midfielder Joe McNeill fired the away side in front, however, Larne regrouped and began to take control of the contest before easing to victory in the second half. A crowd of almost 1,200 packed into Inver Park for the match between the two in-form sides, including a sizeable support for the Amateur League side. The home crowd were on their feet in the opening minutes when it looked like Martin Donnelly would fire them in front, but he was denied by visiting goalkeeper Shane Harrison from close range. It was Star who took the lead on 13 minutes, when Joe McNeill picked up a pass from brother Aiden on the edge of the box to fire past Conor Devlin. At the other end, Donnelly was denied again by Harrison, this time his free-kick was tipped on to the post by the goalkeeper at full stretch. The home side turned up the pressure and were level on 26 minutes. Donnelly was the provider from a corner on this occasion, and it was met by Jeff Hughes, who headed home at the near post. The senior side began to dominate proceedings, but had to wait until the 65th minute to get their noses in front. Paul Trainor’s side looked to be tiring in the closing stages but Devlin still had to be alert to turn away an Aiden McNeill cross from the left. 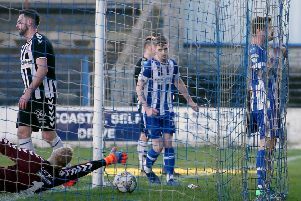 Passage to the last eight - where the Invermen will face holders Coleraine - was wrapped up on 90 minutes when McDaid was in the right place to tap Lee Lynch’s cross home from six yards out.